So for Tuesdays I thought I would write about one of my loves and what all of my continuing education has focused on…the art world. I love how art is completely and totally subjective. The fact that no two people really see or get the same reaction from a work of art, whatever it might be. Therefore Tuesdays will be dedicated to art and art destinations. 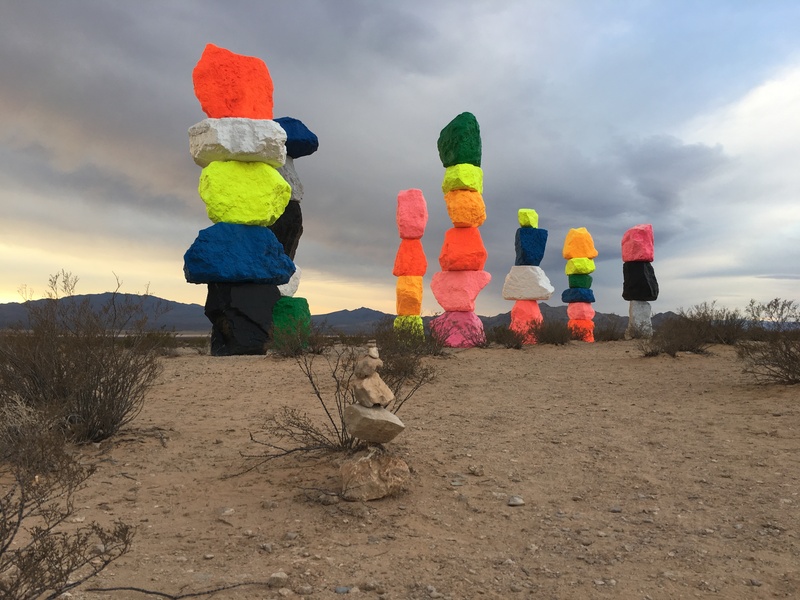 Heading South on I-15 about 20 minutes outside of Las Vegas is an installation by the artist Ugo Rondinone. 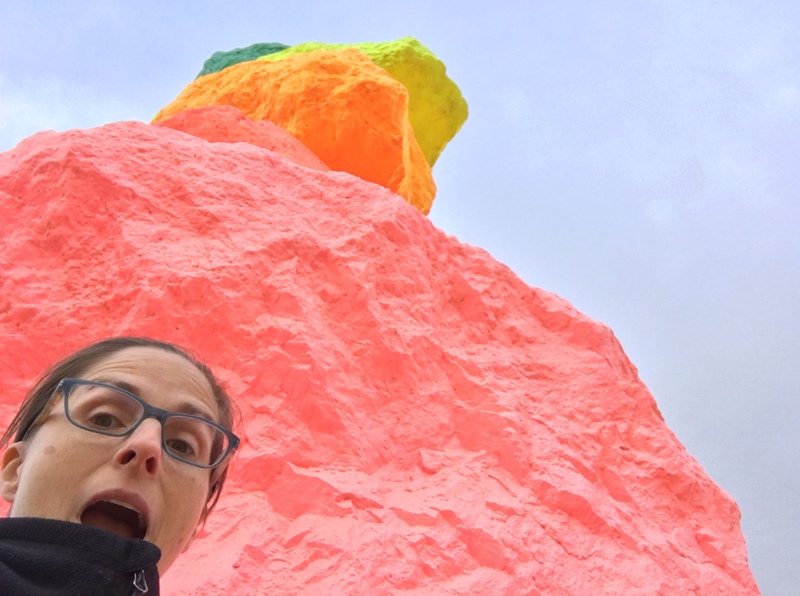 Seven Magic Mountain is a series of seven precariously stacked, colorful totems in the middle of the Mojave Desert. Although you cannot see it from I-15 heading South, it is completely visible from the Northbound side. A riot of color in the otherwise brown hued desert. Seven Magic Mountain is symbolized by the author as the mid-way point between the natural and the artificial. I can see his point, yet for me when I first saw it, with all of my years of experience in the art world, I thought what a beautiful juxtaposition to the surroundings. The second thing I thought was that it was a comment on contrasts, which sort of coincided with what the artist meant for the piece yet his definition was a little more in-depth. The second time I had the opportunity to view the work I was driving back from California. I was tired and desperately seeking home, when I saw the installation my spirits lifted and I found my sleepiness subsided. It provided joy at a much-needed time. It’s those visceral reactions that made me first fall in love with art and it’s how I determine how valuable a work is to me. If a piece touches me in a way that I have an emotional reaction to it, I know it’s special, hence the beauty of art being subjective. Because the reality is I can look at million dollar Damian Hurst paint by numbers and feel nothing but a piece of street art can take my breath away. Visiting the work this morning and having the installation all to myself was a beautiful experience. I drove out after coaching this morning and wanted to get some pictures for the blog. Being with these majestic stone structures at the start of the day gives a rejuvenation to your soul. Seeing them in pictures does not give justice to the impact of their grandeur. (Well maybe you can tell a little by the picture below and in the feature image. If you look closely you can see a set of zen stacked stones in the foreground.) It’s well worth the 20-30 minute side trip from the Las Vegas Strip if you’re in town visiting. Art installations are all around us. Next time you find yourself walking around your city, keep your eyes open for the works that make you pause. Those are the ones that touch you, that make you feel. Until next time, life is short, travel now!